Today’s animation is a roasted pig head provided by Virginia Commonwealth University (VCU) student John Bush. 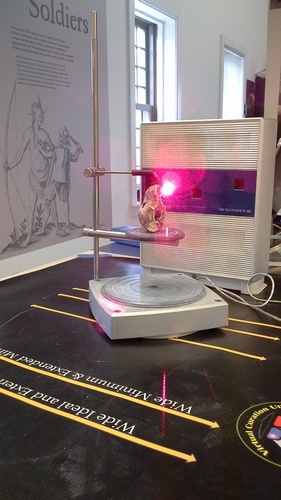 The pig head was scanned in a frozen (but thawing) state, which added some urgency to the scanning process. Following scanning of the pig head, John defleshed the pig head off site, and the VCL subsequently scanned the pig’s cranium and mandibles prior to their incorporation into an experimental archaeology project presented by John at the 2014 VCU undergraduate poster conference. This animation was created by VCL’s Digital Curation Specialist Lauren Volkers on April 29, 2014. 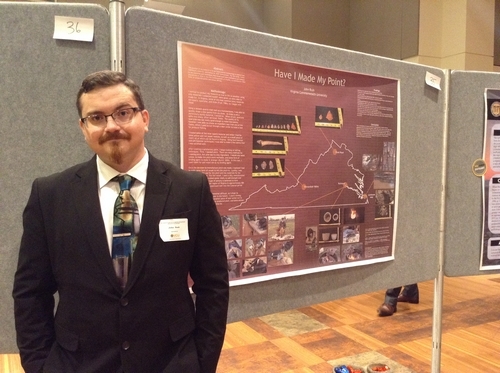 John Bush standing adjacent to his experimental archaeology poster. Today’s animation is the right radius of a passenger pigeon (Ectopistes migratorius) recovered archaeologically from an American Indian village site and now held in trust by the Virginia Museum of Natural History. The passenger pigeon became extinct one century ago this year. Today’s animation is a preserved alligator head provided by Virginia Commonwealth University student John Bush and was purchased as a tourist souvenir in Florida. Today’s animation is a snail’s shell (Cittarium picus) that was recovered archaeologically by Jamestown Rediscovery at James Fort. This shell is from an edible species of snail native to Bermuda. 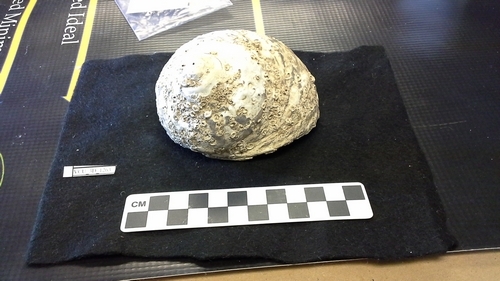 It was scanned on April 18, 2014 at the Jamestown Rediscovery laboratory. According to Mark Kostro of the Colonial Williamsburg Foundation “Cittarium pica is a marine snail living in the rocky intertidal. Their shells, however, are often re-occupied by hermit crabs thus bringing them onto land, among other forces, anthropogenic or otherwise.” Jamestown Rediscovery curator Merry Outlaw notes that the species became locally extinct on Bermuda, which impacted the hermit crab population. The species has been reintroduced and is now protected. Today’s animation is a tea spoon recovered archaeologically at George Washington’s Ferry Farm. This spoon was used when tea was served in the Ferry Farm house, an important aspect of the proper duties of a gentry-class woman in the 18th century. Today’s animation is a butchered dolphin bone recovered archaeologically by Jamestown Rediscovery. 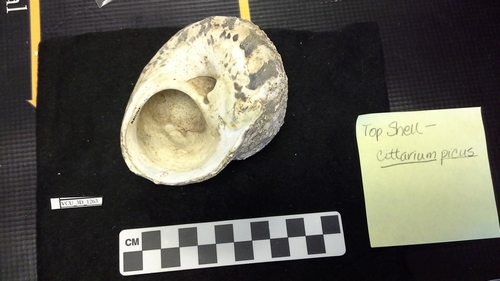 It was scanned on April 18, 2014 at the Jamestown Rediscovery laboratory. Cut marks on the bone indicate removal of flesh for consumption. 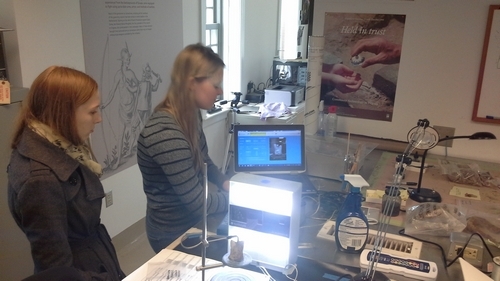 Intern Becki Bowman looks on as Digital Curation Specialist Lauren Volkers scans the butchered dolphin bone. Today’s animation is a Roman oil lamp recovered archaeologically by Jamestown Rediscovery from a 17th century context in summer 2006, as detailed here. It may have been part of a gentleman’s cabinet of curiosity. 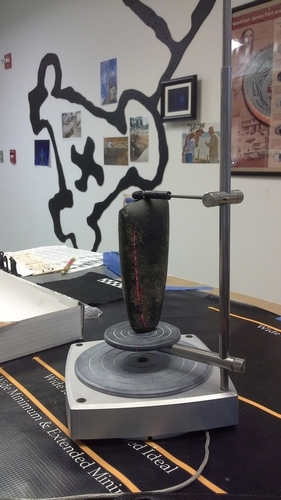 This object was scanned in the Jamestown Rediscovery laboratory on April 18, 2014. 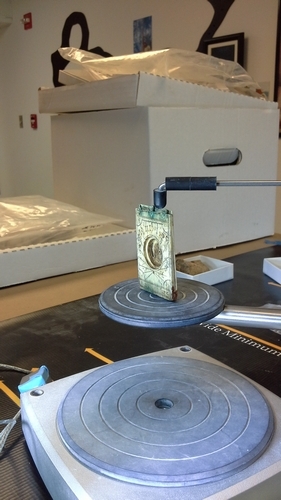 Today’s animation is an ivory compass recovered archaeologically by Jamestown Rediscovery in May 2012. This compass was manufactured in Nuremberg, Germany. Details on this compass and its finding can be found here. 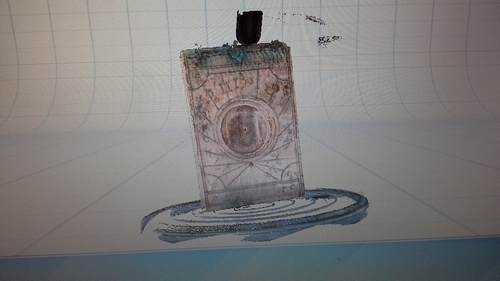 It was scanned on April 18, 2014, in the Jamestown Rediscovery laboratory. Today’s animation is a pewter spoon recovered archaeologically at George Washington’s Ferry Farm. The spoon has raised initials on the handle, “BW,” that likely stand for Betty Washington, George Washington’s sister. This spoon was used by Betty when she served tea, an important aspect of the proper duties of a gentry-class woman in the 18th century.